Sony KD-49XF9005 4K HDR (2018) review | What Hi-Fi? For a product as modern as a 4K HDR television, the Sony KD-49XF9005 has a surprisingly strong legacy behind it. It’s the sequel to last year’s KD-49XE9005 – which was good enough to take home a What Hi-Fi? Award – and is the smaller sibling to the five-star KD-65XF9005. So we have pretty high expectations - and we are pleased to report Sony has delivered another very accomplished set. There’s no doubt this Sony looks the part. Its slim bezels keep this television looking sharp, although the splayed legs upon which it stands are rather attention-grabbing. On the plus side, they’re practical and allow space to place a soundbar underneath. On the other hand, it’s difficult not to picture someone manspreading on the train. The KD-49XF9005’s screen has direct LED backlighting with ‘Dynamic Backlight Control’, so it can go brighter and more accurately adjust the lighting in certain parts of the screen, providing better handling of contrast within areas of similar colour. Like its big brother, this 49in XF9005 gets Sony’s X1 Extreme processor, previously reserved for the company’s flagship sets. This brings with it more advanced upscaling and motion processing, thanks to X-Reality Pro and X-Motion Clarity respectively. All of that’s going on more-or-less behind the scenes. At the front of house, you have the Android TV operating system, which gives you access to all of the streaming services. Netflix and Amazon Prime Video are included (and in 4K HDR), as well as catch-up apps from the BBC, ITV, All 4 and Demand 5. The iPlayer app is also 4K compatible, so you can watch the World Cup and Wimbledon in the sharpest resolution currently available. Predictably, Google Play Movies & TV features prominently on Android TV’s homescreen, and is more enticing than ever thanks to the recent upgrade of some titles to 4K HDR. If you’re after pay-as-you-go blockbusters in the best quality currently available, this is the place to go. Android TV also brings with it support for Google Home and Amazon Echo control, so if you have smart speakers you can use them to search and play content. The operating system itself isn’t as clean or snappy as some rivals (Samsung and LG lead the way here), and there is a bit of judder to menus and some sluggishness when you try to access different features. However, it is fairly simple to use and gets better with every update. The remote control looks less expensive than last year’s handset, instead going down the plastic route and featuring more prominent, spongier buttons. It’s similarly cluttered, though (six buttons around the direction pad is too many), so you’re likely to find yourself looking down at the zapper more than you’d like. Still, there are dedicated Google Play and Netflix buttons for anyone using those services. For those who want to connect up Blu-ray players or games consoles, this television comes with four 4K-compatible HDMIs, three USB sockets, an optical audio output, a mini-jack AV input and an ethernet port in case your wi-fi is flaky. An IR Blaster port (and a bundled blaster) and headphone jack are thrown in for good measure, too. Setting up the Sony for its optimum picture is straightforward. While most picture processing modes can stay on the default 'Medium' setting, we prefer to switch off Sony’s 'Reality Creation' feature. We’re also happy with Sony’s default motion processing settings – there are few other manufacturers we say that about. The 'Light Sensor' should be turned off for all sources and signals, and while we leave 'Live Colour' set to 'Medium' for HDR content, switching to 'Low' is sensible for everything else. Once calibrated, we kick off with the 4K HDR Blu-ray of Guardians of the Galaxy Vol.2. Sitting the KD-49XF9005 side-by-side with its predecessor the KD-49XE9005 (it's still our favourite 49in TV), it’s evident the newer set is squeezing out just a bit more contrast, colour, and punch from the picture without sacrificing the core, natural performance. As Ego (Kurt Russell) and Meredith Quill (Laura Haddock) drive through Missouri, the farmland is rich and earthy, contrasting nicely with the range of green hues of the grass and the bright – but not unnaturally vivid – blue sky. Moving into a close-up, the streaks in Ego’s hair are warm and organic, and there’s subtler layering of colour in Quill’s blonde locks than there is from the XE9005. But this television really comes into its own with the contrast between deep blacks and bright whites – or rather, the gold of the Anulax batteries (or Harbulary batteries, according to Drax). When they’re firing up against the darkness of space, their shine looks truly alien. Even then, the reflected light on Starlord’s (Chris Pratt) face is natural, with nuance between the left and right sides. The KD-49XF9005 is also more detailed than its predecessor, too – Starlord’s moustache is thicker and bushier than when viewed on the older set. It’s unlikely that you’d notice the difference by itself, but putting the two TVs next to one another demonstrates this clearly. The deeper blacks do occasionally come at the cost of a hint of detail, but we feel that’s a fair trade-off in this instance - particularly in light of the richer colours afforded by the greater depth. Switch from HDR to SDR and it’s an even better story. We put on Spider-Man: Homecoming and when Peter Parker rushes to confront The Vulture in his lair, the texture to the rubble is a little more explicit from the XF9005 than from the XE9005. Similarly, the mould on the ceiling is noticeably finer - there's slight blurring from the older model. Action scenes are handled well. When our hero jumps around to avoid the falling rubble, this television manages to capture every spider-swing. It’s smooth without looking overly polished and, when the ceiling collapses on top of the teenage vigilante, the weight of the concrete is well conveyed. Finally, we watch some of the FIFA World Cup via YouView in standard definition, and are met by a perfectly watchable picture the KD-49XF9005 has upscaled with a careful hand. There is the expected lack of detail in the background of the game, but the colour range keeps its character and you shouldn’t have any complaints considering the low quality of the signal itself. With two downward-firing 10W speakers in the usual stereo array, the KD-49XE9005 handles sound relatively well – especially considering its near bezel-less design. Voices are clear enough and there’s decent dynamism but, as always, we recommend pairing the telly up with (at least) a separate soundbar. Here, the five-star rated Sonos Beam would be an excellent choice. 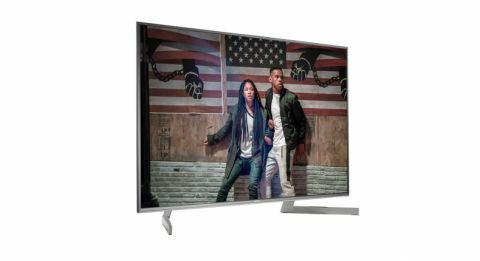 While the KD-49XF9005 is undeniably a better TV than its predecessor, the improvements are really quite slight in the grand scheme of things. Given what a belter of a telly the XE9005 was (and still is), perhaps that is only to be expected. But while owners of the XE should feel no need to rush out and upgrade, the XF is the better TV - particularly in terms of colours and contrast. That makes this the 49in TV to beat as our Awards approach.